Jaime Lanier is a trustee of the Ray C. Anderson Foundation. 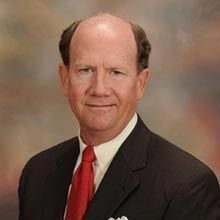 He retired from Interface in May 2016, after 35 successful years in roles including Sales for Interface Flooring Systems, General Manager for Re:Source Georgia, Interface’s former service and installation division, VP of Sales for Higher Education, VP of Sales for Transportation, and VP of Sales for Multifamily. Jaime retired from Interface as VP of Customer Development for Interface Americas. This final role with Interface allowed him to create and initiate sales tools to further enhance client relationships and sales opportunities for veteran sales executives and mentor new sales executives. Most importantly, he helped instill in them the core sustainability values that Ray Anderson held so dear, since many of the new sales associates never had the chance to know Ray personally. Jaime previously worked with the company’s sales account executives and regional vice presidents to support their sales efforts in the higher education and multifamily market segments as well as supporting higher level needs of these clients. He also helped educate the sales force about Interface’s corporate mission to become a sustainable enterprise and how sustainability applies to higher education and multifamily. Sustainability is a driving force for Interface with applications in product development, manufacturing and customer product selection. In recent years, sustainability has become a key purchasing factor for many customers within the higher education and multifamily segments. Jaime’s sales experience with Interface included corporate, healthcare, public sector, transportation, education, multifamily and retail clients. Prior to joining Interface he was a loan officer in the banking industry. Jaime was active in a number of education-oriented professional associations including ACUHO (Association of College & University Housing Officers), APPA (the Association of Higher Education Facilities Officers) and SCUP (Society for College & University Planning). He is also a former member of IFMA (International Facility Management Association) and Rotary Club and a current member of the USGBC (United States Green Building Council). A native of Miami, Florida, Jaime is a graduate of Furman University, where he currently serves on the Board of Trustees. He and his wife, Mary Anne Lanier, live in Marietta, GA and have three sons, two daughters-in-law and three grandchildren. Jaime is currently the Chair of the Catholic Foundation of North Georgia and also serves on the Marist Way Board at Marist School. He is the former Project Chair for St. Joseph Catholic Church’s Building Committee.